Documents required from foreign students wishing to apply for an undergraduate programme (Bachelor). Please note: when applying for a Bachelor ’s degree program a candidate should be under 26 years old. Required documents have to be sent via email at: io@wsiz.rzeszow.pl. Should you encounter any problems when preparing your application please contact the Recruitment Specialist for International Students directly. Contact details are mentioned in the tab Contact us. Application Form for Undergraduate Studies (available here). Motivation Letter addressed to the Director of Finance and Development including justification of one’s choice of a particular field of study. Curriculum Vitae in English signed by the candidate. High School Education Diploma including a marksheet (original copy and sworn translation into English or Polish) with Apostille or legalized by the Polish Embassy (see the complete list of members of Hague Convention Abolishing the Requirement of Legalisation for Foreign Public Documents). Eligibility certificate in which it is stated that candidate has the right to apply for admission to any tertiary institution in the country under which educational system his/her High School Diploma was issued. Statement of the total number of years completed at school (including primary, secondary and/or higher secondary school) has to be also added to this document or provided separately. 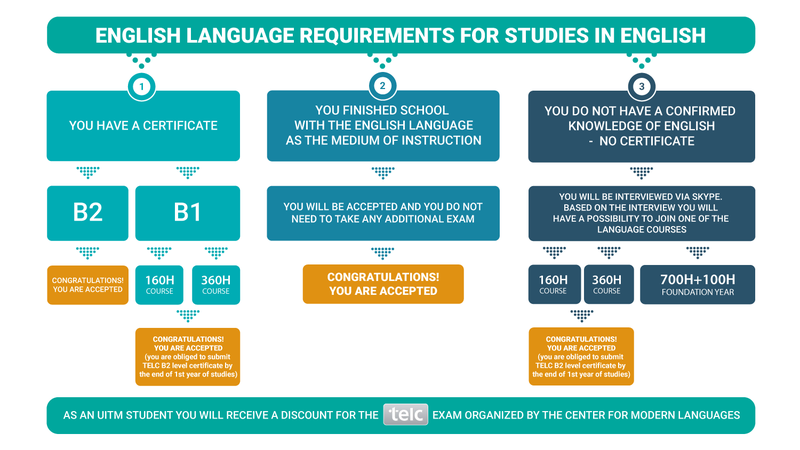 If English was the language of instruction during previous education it can be mentioned in the Eligibility Certificate as well. Please, download the template of this document here: Template of Eligibility Certificate. NOTE: The requirement does not apply to candidates for whom English was the language of instruction and examination at school. Health Certificate (stating that that candidate is in good health and capable of commencing studies abroad). 1 Photograph 35×45 mm (undamaged, up-to-date colour photographs exposed evenly on a light background, made not earlier than 6 months before). Documents required from foreign students wishing to apply for a postgraduate programme (Master). Please note: when applying for a Master’s degree program a candidate should be under 30 years old. Required documents have to be sent via email at: io@wsiz.rzeszow.pl. Should you encounter any problems when preparing your application please contact the Recruitment Specialist for International Students directly. Contact details are mentioned in the tab Contact us. Application Form for Postgraduate Studies (available here). High School Education Diploma including a marksheet (original copy and sworn translation into English or Polish). Bachelor’s Diploma (original copy and sworn translation into English or Polish) with Apostille or legalized by the Polish Embassy (see the complete list of members of Hague Convention Abolishing the Requirement of Legalisation for Foreign Public Documents). Transcript of Records (original copy and sworn translation into English or Polish) with Apostille or legalized by the Polish Embassy. NOTE: The requirement does not apply to candidates for whom English was the language of instruction and examination at university. All of the documents required for the admission procedure as well as diplomas/official mark sheets/ transcripts must be submitted as originals. At a student’s request the University may offer help with finding accommodation in a student’s dormitory only. The request for accommodation must be sent while applying for studies via email. There is a possibility of providing transport from the Warsaw airport, for a group of at least 10 people, at the approximate cost of 50 EUR per person. Every foreign student is obliged to purchase health insurance. EU/EEA citizens should possess European Health Insurance Card (EHIC). For Non-EU/EEA it is highly recommended to sign a health insurance agreement with the Polish National Health Fund (the monthly rate is PLN 46.80) or with one of private medical centres which covers all basic health services (min 30 000 EUR). There are no exceptions to this rule in accordance with the ordinance of the Ministry of Science and Higher Education October 12, 2006, Art.1, Point 2, Section 3, on foreigners undertaking and continuing studies and participating in scientific research and training. Nostrification is a procedure whereby a foreign educational qualification is compared to its Polish equivalent and their equivalence determined. According to the Ministry of Science and Higher Education of October 12, 2006, Art.1, Point 6 on foreigners undertaking and continuing studies and participating in scientific research and training: “The candidate is required to submit a certificate stating its equivalence with the relevant Polish maturity certificate / diploma of higher education, not later than till the end of the first semester of studies”. Failing to comply with this requirement will result in the student’s expulsion from the university. The Education Office in Rzeszow (Kuratorium Oświaty w Rzeszowie) is a pertinent institution in charge of the nostrification procedure. Temporary residence permit is a kind of residence permit which you may apply for when your visa expires and you are still planning to stay in Poland. The first permit is issued for a period of 15 months (the period of the academic year or the preparatory course, extended for a period of three months). The next permit may be granted for the maximum period of 3 years. The minimum amount required while applying for the temporary residence permit in Schengen area is 630 PLN per person/month, or its equivalent in a foreign currency.